‘Sutra’, by choreographer by Sidi Larbi Cherkaoui, showcases Shaolin monks in an intriguing performance of martial arts, contemporary dance and ephemeral sculptural pieces. The piece traces interactions between an outsider, a delightfully youthful monk and the main corps of monks from uneasy coexistence to an integrated community. It’s easy to see how Cherkaoui’s piece has endeared international audiences in 33 countries. The stark presence of the extraordinarily disciplined Shaolin monks, unmistakably human interactions sprinkled with animal caricatures and an ever-shifting environment of boxes mesmerised the audience. Laughter periodically punctuated the performance – and not just from the typical loud theatregoers, who feel inclined to audibly project their cultural intelligence. At the opening, soloist (Ali Thabet) sits cross-legged, gesturing with his hand, as the intrigued young monk watches. A member of the monk order, equipped with a spear, mimics the hand movement – much like a dance enactment of voodoo dolls. The air whines, as the monk expertly cuts through the space with his staff in an unconventional trio with Thabet and his weapon. Thabet’s power also allows him to manipulate blocks, which in turn dissemble and reassemble the large boxes in formations throughout the show. The young monk invokes this same ability later on. At one point, two monks stand guard atop the blocks, reminiscent of the Great Wall of China. During another scene, monks tip their individual towers forward and daringly ride them down. When the boxes lay horizontally, the monks launch off the containers in a dizzyingly fast round – which creates the enchanting effect of watching a long exposure photograph in motion. The vignettes, although linked with smooth transitions, stirred more questions. For example, how did the soloist “outsider” acquire his power? What sparked the camaraderie between him and his tiny monk friend? And what are the individual’s intentions? Thabet’s relationship with the corps of monks ranges from playful to menacingly antagonistic, but his final integration seems a fitting way to close the show. The soloist’s part, although originally added in shortly before the premiere, adds a unique counterpoint. But, as an Asian-American viewer, it was difficult for me to look beyond race – especially as a mostly anonymous mass of monks countered a single light skinned dancer. The heavy martial arts sections display the beauty in the cultivated kung fu forms: firm punches, jump kicks with switching legs, kip-ups, handless ‘aerial’ cartwheels and gravity defying butterfly kicks. 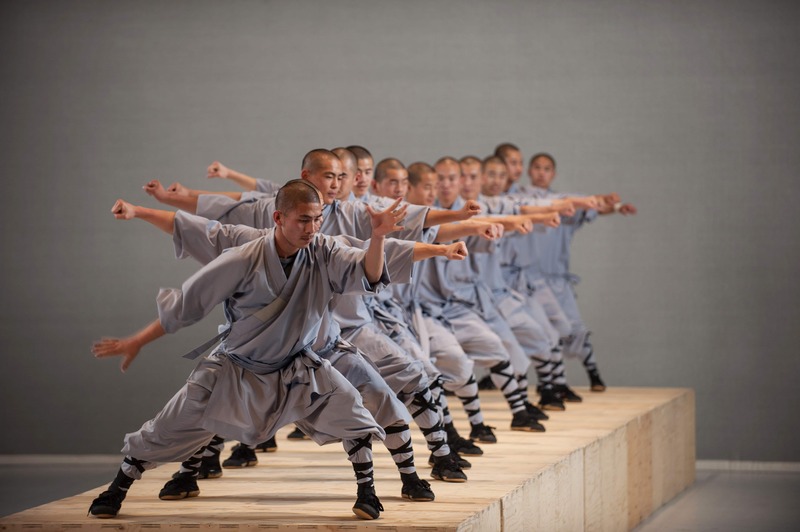 But less frenetic Tai Chi influenced sections also demonstrate the mature movement of the Shaolin monks with simple weight shifts and controlled arm movements. Witnessing the monks explore individualised expressive movement during their solos is a show highlight – as is the simply clever, touching duet between Thabet and the tiny monk, sheltered within a box. As the show closes, ‘Sutra’ transports the audience to the Shaolin monks’ temples, where the devotees practise kung fu behind Stonehenge-like structures. The force of their movements is amplified as more members join the collective movement. When monks exit, a new wave washes in, continuing the exercises until the entire collective moves in sync. With social equilibrium achieved, the unity of preserving this ancient tradition makes a powerful statement. Reviewed on 26th of March at Sadler’s Wells.